Jesska Denise: MUA Lipstick Shade 4. I picked up this lipstick a couple of weeks ago when I was up North shopping as it was only 1£ and I really liked the shade. I really wanted to try out some of the MUA products after seeing countless bloggers rave on about them but much to my disappointment the superdrug I went to had nothing I had my eye on. The lipstick itself isn't very pigmented. So if you're looking for a pink that screams 'look at me' this isn't for you. 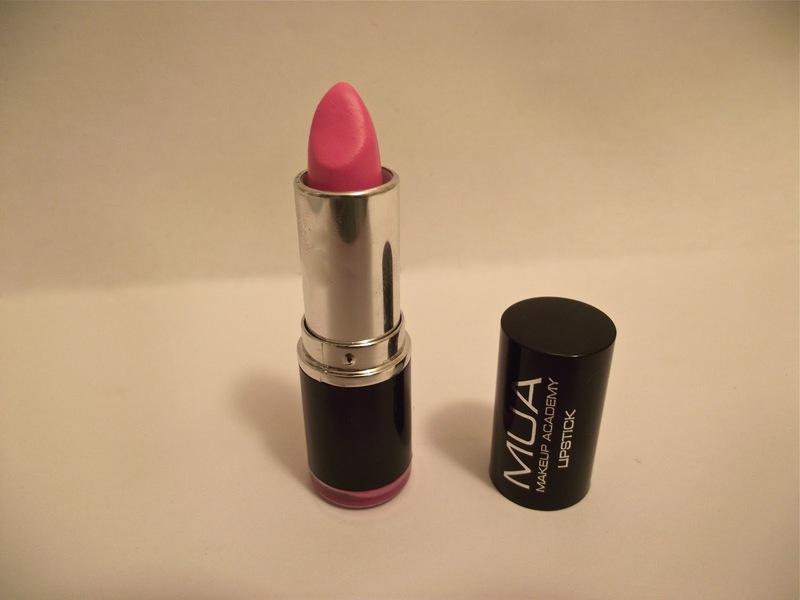 It leaves a lovely pink glow on your lips thats perfect if you're going for a more natural look. Its a creamy finish rather than matte. Much like that of a lipgloss. I didn't think I'd like this as I love my matte lipsticks but I really find myself reaching for this a lot more than some of my other lipsticks. As its more glossy it nourishes my lips and doesn't dry them out. Which is what we all want right? I was also surprised to find that when you twist the plastic piece off the bottom, they include a tiny little lip balm in the same colour as the lipstick. Have any of you tried any of these lipsticks?